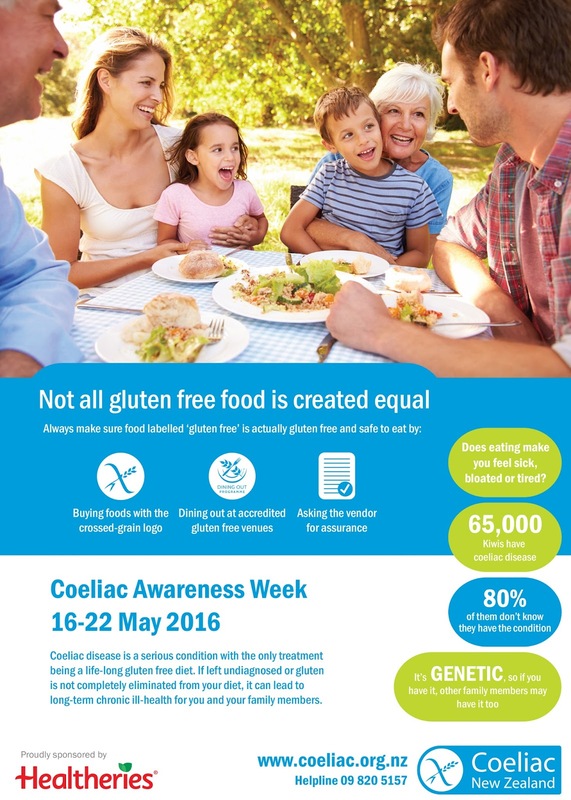 Coeliac Awareness Week is this week (16th-22nd May). The week aims to shine a light on coeliac disease by spreading the word about getting tested, eating well - by providing information about food and ingredients, and general awareness about coeliac disease and what that means for those diagnosed and their support people. This Coeliac Awareness Week marks the launch of the Gluten Free Accreditation 'Dining Out Programme' for cafes, restaurants and other food outlets. Businesses will only become accredited after successfully completing a training program and independent audit. The aim is to open up the gluten free dining out experiences for coeliacs by providing this extra level of assurance that their gluten free food is safe to eat. I was only diagnosed with Coeliac Disease in January of this year after being hospitalised for complications following my hysterectomy. While I was there, the doctors took some bloods and were concerned about my low levels of iron, B12, Vitamin D and my overall undernourishment. As someone who eats healthily, I was surprised that all of my levels were low. A dietitian referral was made whilst I was in hospital, and a lovely lady came to see me. Once we had gone over what I usually eat, she asked me about my family history. I do have uncles and a grandfather with Coeliac Disease already, but six years ago the dietitian I saw for my suspected IBS after a normal colonoscopy had suggested a low FODMAP diet instead of specifically gluten free. However, this time my blood tests included an antibody test specifically for Coeliac Disease, and my results came back highly positive. By this time I was luckily out of hospital, so I went to see a private gastroenterologist. He performed a biopsy during a gastroscopy, and this came back with a positive result. A lot of my symptoms had been written off in the past as being IBS, related to my endometriosis or just me being sensitive to other foods such as dried fruit or onions. However, once my endometriosis was not a factor any more after my hysterectomy, the symptoms continued and I did have a sneaking suspicion that something was wrong. Getting an official diagnosis was actually a relief for me, as I now have a clear plan for the future. As you can see, these symptoms separately don't point to one common denominator, and it was often put down to being a mum, stress, my other health conditions or simply because I was too busy to investigate further. My anemia in particular had been an issue since the birth of my second son in 2012, but was always put down to my heavy periods and never investigated further. The list of possible symptoms related to coeliac disease is huge, and I urge anyone experiencing these symptoms to have a full work up done by their GP. The biggest struggle I have had so far is the misconception about coeliac disease. Coeliac disease is a permanent, autoimmune disorder caused by a reaction to gluten which is found in wheat, barley, rye and oats. Gluten can damage my villi, which is the lining of my bowel, which can end up being very serious if left untreated. It is not imply a case of me getting a sore stomach from eating some bread, or being a fussy eater. It is by no means an easy diet, and some comments I have had are quite hurtful as I did not choose to have this. Yes, gluten containing sauces will irritate me as they do not bake off in the oven, and yes one slice of bread will hurt me. I love this discussion from a reader on Gluten Free Dude's site that sums up perfectly how I feel some days! I am not eating gluten free as part of a fad, or because the latest celebrity has decided to jump on the G-free bandwagon. I am not eating gluten free to annoy you, inconvenience you or to make things difficult when we go out to eat. I am not eating gluten free to be the center of attention or to put a damper on your party. I am not eating gluten free to pay outrageous prices for a single cookie, cupcake, or a tiny little pizza. I am not eating gluten free to pay a lot more for a little bag of gluten free flour. I am not eating gluten free to worry about what I can eat when I go out to eat. I am not eating gluten free because I love to analyze every ingredient on every item I pick up to purchase. I am eating gluten free because that little protein that you cannot see in your muffin, cookie, cake, pie, beer, pizza, soup, and yes, even your soy sauce makes me ill. I am eating gluten free because that little protein hurts my stomach, my joints, my muscles and yes, even my brain. I am eating gluten free because I have a disease. If you have any questions, I would love to help- please comment below and I will respond. In the meantime, the Coeliac New Zealand has some great resources on what to do if you are diagnosed with Coeliac Disease, and there is a huge community within New Zealand that I have found helpful.